George W. Bush went out a side door at the White House and ducked into a waiting car. He didn't want to attract unwanted attention. His schedule said Bush was spending Sunday evening in Washington before traveling the next morning to Australia. Instead, Air Force One lifted off from Andrews Air Force Base after dark Sunday night on a secret flight to Iraq. Only one other car accompanied Bush to Andrews - not the usual contingent of security, communications, staff and VIP vehicles and media vans. The trip was conceived five or six weeks ago as White House officials deliberated strategy for dealing with a Democratic-led Congress trying to force Bush to begin troop withdrawals. Next week will be pivotal because Bush has to give lawmakers his assessment of the progress of the war since his buildup announced in January of some 30,000 troops. For security reasons, Bush's trip - his third to Iraq - was a closely guarded secret. But there had been speculation he might go to Iraq on the way to Australia. Suspicions were raised because Bush was getting to Sydney three nights before the opening of the Asia-Pacific summit, the main reason for the trip. Then, first lady Laura Bush said she would not make the trip because of a heretofore unmentioned pinched nerve. White House officials pleaded ignorance about any trip but on Saturday began reaching out to the 10 or so members of the press who would accompany Bush on his plane. Reporters were summoned for face-to-face meetings with Dana Perino, the incoming press secretary, or National Security Council spokesman Gordon Johndroe. Members of the media were asked to tell only one editor at their news organizations. They also were allowed to tell their spouse. Officials warned the trip would be called off if the secret got out. It held. The small group of reporters, photographers and a camera crew was told to assemble Sunday evening at Andrews. They were given maps with a rallying point highlighted. They were told to use a gate that the press corps does not use normally. The planning was intended, in part, to prevent reporters on Air Force One from bumping into the rest of the press corps which also was gathering Sunday evening at Andrews to board a chartered aircraft to fly to Australia ahead of Bush. The larger press corps would have guessed what was happening if the pool had been spotted. Instead of going to the terminal, the press pool was taken to a hangar that houses Air Force One. Reporters waited on the plane, its window shades drawn, and felt the plane being pushed back at 7:47 p.m. By 8:05 p.m. EDT (0005 GMT), Bush's plane was in the air. The press corps' charter flew to a planned refueling stop in Hawaii. On board, deputy press secretary Scott Stanzel carried a sealed letter with instructions not to open until landing. 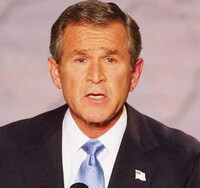 He notified reporters in Hawaii that Bush was in Iraq. The pool of reporters on Air Force One arranged a conference call to their news offices as Air Force One touched down in Iraq at 3:42 p.m., local time. White House officials bristled at the idea that the trip was a publicity stunt. "There are some people who might try to deride this trip as a photo opportunity," Perino said. "We wholeheartedly disagree. This is an opportunity for the president to meet with his commander on the ground and his ambassador on the ground. ... And he will be able to look Prime Minister (Nouri) Maliki in the eye and talk with him about the progress that is starting to happen in Iraq, what we hope to see and the challenges that remain."